To grow seedlings indoors, under lights, it's best not to use regular incandescent bulbs. They produce too much heat. In order to give seedlings the growing power they need, the light has to be just two or three inches away from them. The heat from incandescents would be too much for them. Instead, use fluorescent bulbs, such as the 4-foot tubes that come in ordinary shoplights. They "burn cool," so there's no threat of damage to your seedlings. They have enough intensity of light, and as long as they are adjustable and kept two or three inches away from the foliage, and kept on 14 to 16 hours a day, the plants should be fine. You can hang ordinary shoplights with two 4-foot tube bulbs by adjustable chains, from toggle bolt hooks in the ceiling, or on a large, sturdy, multi-shelf rack. 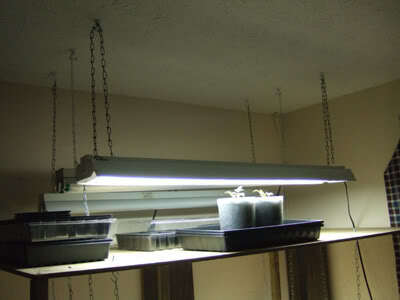 As the plants grow upward, adjust the light fixtures higher by moving the chain links up. It's OK if the top of the plants touch the fluorescent bulbs, but not for long. If you don't want to put hooks in the ceiling, you can put the hooks on the underside of a big table, suspend the light fixtures from under the table, and put your seed trays on the floor. If you are growing your seedlings on a windowsill, you may need to supplement with a few hours of artificial light, especially during the winter. You could use incandescent light for that purpose. Where to start your seeds and set up your indoor light system? Kitchen countertops, television cabinets, ping pong tables -- any flat space will do. Keep in mind that long fluorescent tubes are dimmer at the ends than in the middle. 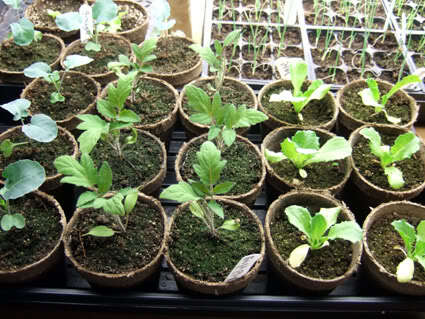 You may have to rotate your flats or trays to make sure all plants get sufficient light. They also diminish in power after one year, so it's a good idea to buy new ones every growing season. When it's dark, plants respirate - breathe -- which is an important part of their growth process. The balance of rest time to active growth time affects many biological processes, including the growth rate. So don't neglect giving your plants daily rest time. A typical schedule might be 16 hours with the lights on, and 8 hours with them off.